We are a non-profit organization dedicated to the renewal of sacred music in the Roman Rite of the Catholic Church. We aim to help parishes and communities of humble means, as well as those with an abundance of resources, to recover the dignity, depth, and grace that have characterized the great traditions of Catholic sacred music. 4.) a network of support for those engaged in our programs. Magnificat Academy was founded in 2005 as a Choir School in Warren, Massachusetts, with a full academic curriculum for boys and girls in grades 4-12. From 2005 to 2008, the school flourished and its Choir brought joy and inspiration to many through its Liturgies, Concerts, and recordings. In 2008, Magnificat was invited to the Cathedral of St. Paul in Worcester, where it served as the Cathedral Choir School until 2011. From 2011 until 2017, the work of the Academy focused on the support of various sacred music projects, in collaboration with other schools and institutions. In 2018, Magnificat entered an exciting new phase of its mission, as a full-fledged Institute dedicated to the renewal of sacred music in the Roman Rite of the Catholic Church. Thus the new name: Magnificat Institute of Sacred Music. Based in Lancaster, Massachusetts, and led by its founding director, Paul Jernberg, we are grateful to have the opportunity to serve Parishes, Communities, and Dioceses throughout the United States and abroad. 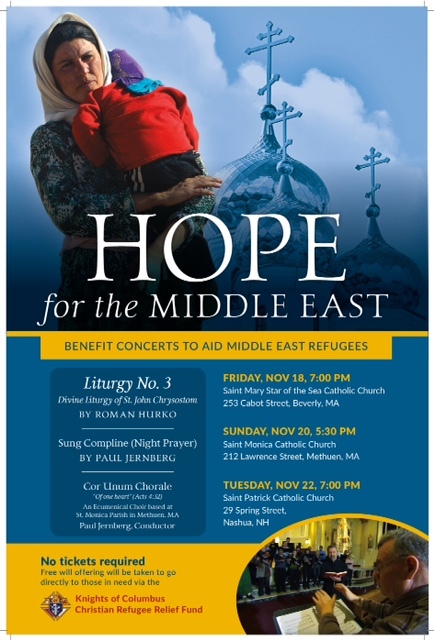 The Cor Unum Chorale presently brings together over fifty singers from throughout New England, who play an important role in the mission of the Magnificat Institute. We sing for Masses, Vespers, and Concerts, and participate in recordings of these events. Our present focus is to help parishes and communities in their quest for a deep and authentic renewal of sacred liturgical music, as a vitally important component in a greater renewal of Faith, Liturgy, and Culture. The Cor Unum Chorale generally rehearses once a month, and sometimes more often when preparing for special scheduled Liturgies and concerts. For further information and/or to audition, click the button below. How did you hear about Cor Unum Chorale?